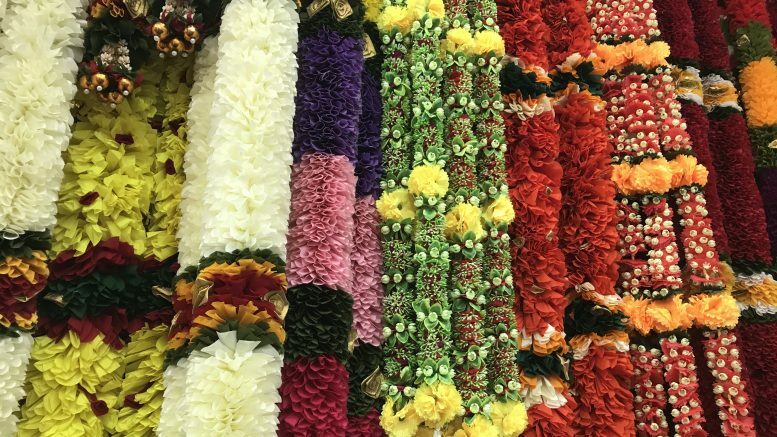 Indian temple flowers in Singapore’s Little India neighborhood. Asian shares may rise on Thursday, getting a fillip from a buoyant Wall Street after big banks Goldman Sachs and Bank of America reported earning which beat expectations. Goldman Sachs reported on Wednesday that net profit surged to US$2.3 billion, swinging from a year-earlier loss due to U.S. tax law changes and beating analyst forecasts, Reuters reported. That sent its shares sharply higher. Bank of America also reported earnings which beat analysts’ expectations on Wednesday. Markets largely shrugged off the latest parliamentary drama in the U.K., after Prime Minister Theresa May beat back a no confidence vote, as expected, albeit by a narrow 325 to 306 margin, which followed her Brexit deal with the EU going down in flames in Parliament, with MPs voting against the plan 432 to 202. Scotiabank said that despite the uncertainty caused by the failure of the Brexit plan vote, markets were sanguine. “Part of the reason is because of uncertainty over next steps with markets possibly assuming that the huge margin of defeat will either bring together a movement toward a better agreement or scuttle the whole thing altogether amid evidence of a modest change of heart against leaving in British polls,” Scotiabank said in a note on Wednesday. “Of course, part of the reason might also be that much of the London-centric commentary is overstating the role of the U.K. in the world,” it added, noting the U.K. accounts for only 3 percent of world equity market capitalization and just over 2 percent of global gross domestic product (GDP) in purchasing power parity (PPP) terms. March futures for Japan’s Nikkei 225 index were up 25 points at 20,535 at 7:27 A.M. SGT; that compared with the index’s close on Wednesday at 20,442.75, down 0.55 percent. Singapore’s Straits Times Index rose 0.52 percent to 3229.11 on Wednesday; January futures for the index were at 3227 on Wednesday, while February and March futures were at 3231 and 3228 respectively. Hong Kong’s Hang Seng Index added 0.27 percent to 26,902.10 on Wednesday, while China’s CSI 300 edged up 0.02 percent to 3128.652. Malaysia’s KLCI shed 0.38 percent to 1673.08 on Tuesday, while Indonesia’s IDX Composite nudged up 0.07 percent to 6413.36. The Dow Jones Industrial Average added 0.59 percent to 24,207.16 on Wednesday, the Nasdaq Composite was up 0.16 percent at 7034.693, and the S&P 500 gained 0.22 percent to 2616.10. Futures for the three indexes were a tad higher in early trade. Nymex WTI crude oil futures for February were down 0.11 percent at US$52.25 a barrel at 7:15 A.M. SGT, while ICE Brent crude futures for March were up 1.12 percent at US$61.32 a barrel at 6:57 A.M. SGT, according to Bloomberg data.